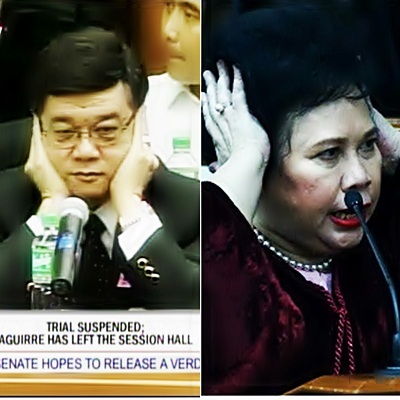 Lawyer Vitaliano Aguirre apologized on national television to Sen. Miriam Defensor Santiago, but insisted that he does not regret covering his ears while the senator was berating the prosecution team during yesterday's impeachment trial. "I have already apologized to her. If I hurt her feelings for what I did, I apologize," Aguirre said in an interview with ABS-CBN News this morning. The lawyer, however, said that he has "no regrets" with what he did during the 26th day of the impeachment trial. "Actually I look at this that I was just made an instrument para maiparating sa mga people concerned," Aguirre said. He said that majority of the members of the House prosecution team already feel bad because lately, Santiago would open the hearing by lecturing them. "Marami rin sa kanila ang nagpipigil na hindi nila malaman ang gagawin para maipahatid nila ang kanilang nasa loob sa ginagawang ito," the lawyer said. He reiterated that a judge lecturing lawyers at the opening of a trial is not part of the usual court procedure. 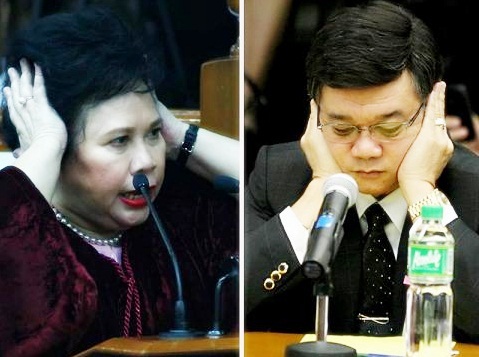 The lawyer, meanwhile, said that he did not mean to disrespect the Senate as an impeachment court. He added that the presiding judge, Senate President Juan Ponce Enrile, has also been fair in handling the trial. 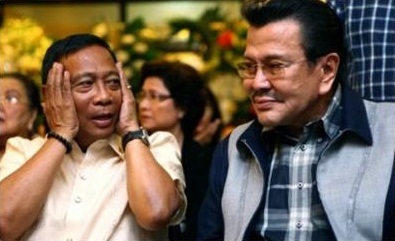 It appears that Binay is reenacting to Erap about what happened between Senator Judge Miriam Santiago and lawyer Vitaliano Aguirre in this picture.